Bioregions are defined by Peter Berg Director of Planet Drum as "Life-Place," a cultural and natural landscape where one lives. Connecting to our "Life-Place," is integral to developing understanding of and appreciation for the natural world and how we as human beings inhabiting bioregions can support the greater equilibrium of Place. In the workshop at Graze the Roof on Saturday, Peter invited us to make a map of the places where we live. We were asked, draw the closest water body to where you sleep, to draw/label native flora and fauna, to draw the type of soil that dominates the land where you live, the highest peaks near your home, and the best and worst contributions of humans to their respective bioregions. Each participant's map had it's own unique flavor and character. I was filled with a deep sense of inquiry, wondering aloud how I, a passionate steward of the natural world, a gardener, an educator did not know the answers to many of these seemingly fundamental questions about Living in Place. I came to the conclusion that this was the beginning of a practice. These questions are opportunities to learn more about the Place that I live and feel so connected to, a chance to discover the layers of beauty that make the Bioregion of Northern California such a special place to be from and to live. After a morning of mapping we began our journey onto rooftops and into the streets of the Tenderloin to explore the different projects that support the ecological balance, habitat, beauty, community and education. We toured Graze the Roof, and the rooftop garden atop the CW House next door to Glide Memorial Church's Foundation Building. From the rooftops to the streets. 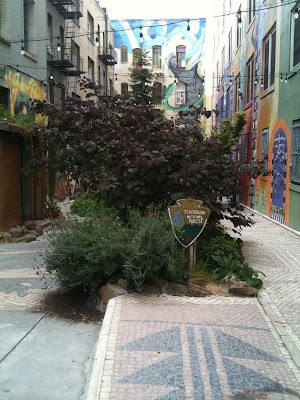 We walked toward a project on Ellis called the Tenderloin National Forest. An alley that has been stewarded by artists since 1989; it is now a community commons, where people of all ages can gather for public art, performance, experimental art projects and classes connected to supporting this inner city garden and art space. I was overwhelmed to discover such a radiant project embodying transformation. When we arrived, the forest was brimming with artists busy at work creating a Hydro-Labratory, water features, tending to succulents and shrubbery, warming themselves by the earthen oven and hanging signs made from recycled materials. It was phenomenal! Connecting to the Places we Live inspires stewardship, community and possibility!